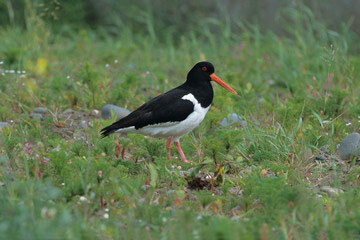 Breeding Oystercatchers have undergone dramatic changes in the last twenty years. There were only 25 tetrads where Oystercatchers were present in the breeding season during our First Atlas and this Atlas, with 116 newly occupied and the species lost from 22. The ‘change’ map shows a major expansion of range inland, especially in the eastern half of Cheshire, and in the south of the county, around Delamere, along the river Dee south of Chester and along the west coast of Wirral. At the same time there are obvious losses especially along the lower reaches of our two main rivers, the Dee and the Mersey. The spread inland parallels what has happened in the rest of northwest England. They started breeding inland on gravel banks in rivers early in the 20th century, colonising the Eden in Cumbria in 1920, the Lune in north Lancashire in 1928, the Ribble in 1934 and the remainder of the Lancashire rivers during the 1950s and 1960s, then, from the 1970s, moved onto agrarian habitats. Birds breeding in farmland have so many advantages that it is easy to see how the habit rapidly spreads: they nest a month earlier than on the coast, suffer lower predation and fledge twice as many young per pair than coastal or riparian breeders (Briggs 1984). Their normal nest is on the ground, amongst shingle or rubble, and often on bare earth in the middle of fields inland, with three eggs incubated for nearly four weeks. In Scotland some birds nest in the tops of rotting fence-posts and a similar habit has taken hold amongst Oystercatchers alongside the Manchester Ship Canal at Frodsham Marsh (SJ47T/ Z) where up to four pairs now nest in the tops of wooden jetties, surrounded by, and a metre or more above, the water of the canal. This is the only British wader where the adults feed their chicks, mostly on earthworms for the inland breeders. Most habitat codes (76) were from farmland (33 improved grassland, 8 unimproved grassland, 22 mixed grass/ tilled land and 13 tilled land), with 62 alongside freshwater bodies and 12 on damp semi-natural grassland including six on estuarine saltmarsh. Oystercatchers are long-lived birds, with some known to have reached the age of thirty, and females do not breed until at least three years of age, with males delaying until five or older. There seem to be few immature birds in the county during the breeding season and it must be supposed that they spend the summer elsewhere, probably on their wintering grounds in France and Iberia (Brown & Grice 2005). The Oystercatcher breeding population of Cheshire and Wirral in 2004-05 was large enough to be sampled on Breeding Bird Survey transects, and is estimated at 510 birds (with a confidence range from zero to 1,220), at least a tenfold increase on the figure of 20 pairs suggested in our First Atlas.